Here, seven fantastic ways to use eco-friendly farmed salmon. Thanks to improvements in technology and eco-conscious companies like Skuna Bay, the farmed salmon industry is winning over the fish elite. Here, seven fantastic ways to use eco-friendly farmed salmon. A quick, creamy sauce made with hot serrano chiles is terrific with luscious fillets of roast salmon. Ready in just 20 minutes, this healthy dish features Dijon mustard, dry mustard and yellow mustard seeds. This Japanese-inspired recipe is great with buckwheat soba noodles. Tahini gives this excellent herbed yogurt sauce delicious Middle Eastern flavor. 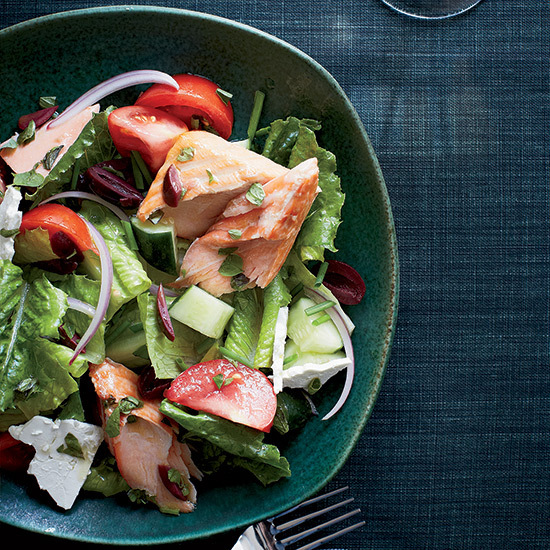 Adding roasted salmon to a classic Greek salad turns it into a hearty main course. Michael Solomonov's incredible dish features salmon marinated in a tangy cilantro-based Moroccan sauce. Everything in this dish roasts at the same temperature, for an easy-to-make weeknight meal.